This past Friday I spent the morning hanging out with Hoda Kotb, of Today Show fame. I wanted to share this story with you and talk about how this all came about and what it’s doing for my business! By now most of you know Christina Daves, my Co-Host in my Get Seen Be Heard interview show. Let me take you back a few years. I listen to EVERYTHING I can find about LinkedIn. I wasn’t born knowing this stuff, and I like to hear what every single LinkedIn expert is saying! I learn something from everyone, and then I can determine if it’s something I can implement and incorporate in my teachings. So I’m listening to a webinar, and Christina was the guest. She was talking about how important LinkedIn can be for your Public Relations efforts. As she was talking, I was thinking “every word that’s coming out of this woman’s mouth is something I would say”. I LOVED the interview, and reached out to her after the interview to tell her that. I was working on Portraits and Profits at the time and we were looking for someone to facilitate the PR piece of the training. Now remember, I didn’t know Christina AT ALL, but went with my gut. She loved the project and agreed to be a part of it! Portraits and Profits doesn’t have anything currently on the calendar, but Christina and I became fast friends and we’ve been working together on projects ever since. Oh and we have some fun too! 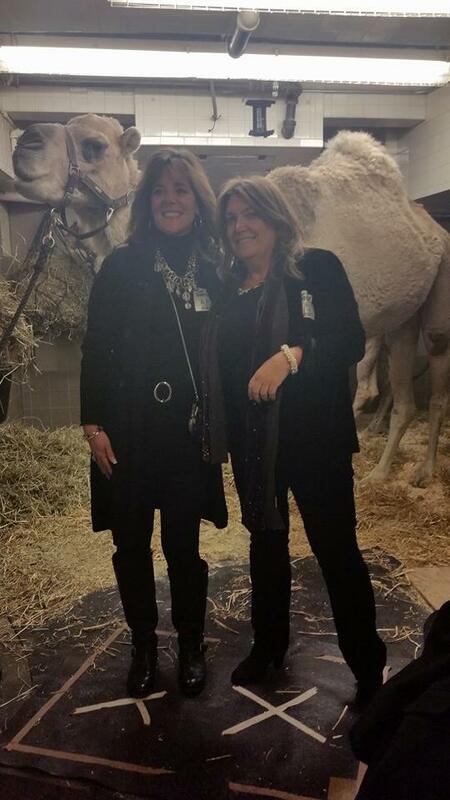 Check us out backstage at the Rockefeller Center Christmas Spectacular with the camel. Business Lesson 1 – JUST ASK. I reached out to a perfect stranger, introduced myself and asked her to be a part of my project. She agreed. Since that time, Christina and I discovered how much more powerful our individual work was when we combined our efforts. We started bringing each other in on private client projects, she does her PR magic, feeds me names of journalists and publications she’s targeting, and I incorporate it into the social media strategy. MAGIC happens folks, I’m telling you. Our clients are getting amazing results. Which led to Get Seen Be Heard. Working privately with us is an investment, it’s a ton of one-on-one time with us both. We wanted to find a way to bring these techniques to more people! #GetSeenBeHeard was born and we’re interviewing AMAZING smart successful people each week. They’re sharing their secrets on how they’ve grown their businesses, and we’re loving every minute of it. Join us live on Blab each week! Check either Christina’s profile or my profile to subscribe and get to chat with us both directly. When Christina called me a few months ago to tell me she landed an interview with Hoda Kotb, I was THRILLED for her. She works her tail off to get these kinds of opportunities for her clients and I loved that she landed this one for herself. For months I saw her planning this event, getting amazing sponsors, pulling together the event of a lifetime. About two weeks ago I said to her “I want to come”. I wanted to go, not only to be there to experience the amazing event, but to support Christina. I had (and still have!) no idea how or if this would benefit MY business, but I knew I had to be there. So I offered to come and do all the social media for the event, for free. Christina went into action, getting me a front row seat next to Hoda’s mom, getting me unlimited access to all of the individual events, and getting me my first press pass. And it was unbelievably amazing. Christina knocked the interview out of the park, and I was running around like an ant taking pictures and posting them all over PR for Anyone’s social media sites. Somehow, I was the only person allowed to post, everyone else had to repost MY stuff! The event was held in the Capital One corporate offices, the Capital One social media team worked through me to get their stuff posted. The Virginia Tech people worked through me to get their stuff posted. The other sponsors worked through me to get their stuff posted. It was SO MUCH FUN. And Hoda was a doll. As was her mom and her team. They were so fantastic and warm and friendly. Here are a couple of pics. Business Lesson 2: Be generous with your expertise, even when you’re not sure how it’s going to pay off! And then my girl Christina. Holy Macaroni. She ROCKED the interview with Hoda. She came up with a big idea and made it happen. Christina and Hoda are both graduates of Virginia Tech, and she found that commonality and made it win-win for them both. 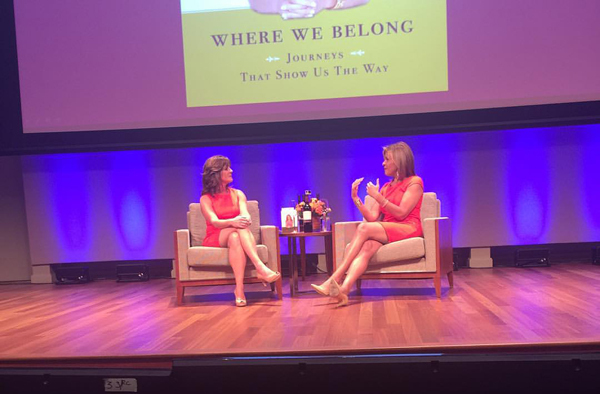 She created an event in Hoda’s book tour that is sure to stand out from the rest, and got to know and interview Hoda personally. Amazingness. How did she land this gig? She asked for it. Business Lesson 3 – ASK for what you want. Yup, it bears repeating. If you don’t ask, it’s a no. So in your business, what big dream do you have? Who can you ask today to take a step towards making it happen? I want to know! Comment below, tell me what your big ask is this week. And if I can help YOU, just ask. Awesome article! And how great for Christina! 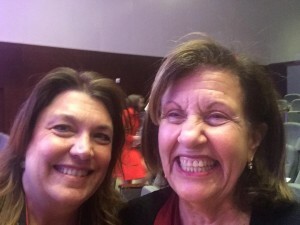 They vibe on Hoda’s show seems to be very positive Thank you for sharing the experience, and remind us to “ask”!